Isotype control antibodies are used to estimate non-specific binding of primary antibodies due to Fc receptor binding or other protein-protein interactions. Isotype control antibodies should have the same immunoglobulin type as the test antibody. 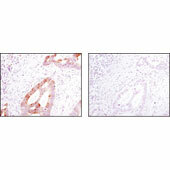 Featured Image: Rabbit (DA1E) mAb IgG XP® Isotype Control #3900.